Updated launcher bar, new dropdown for autoattack mode. This is the full interface, v11.9 by Zonx is no longer needed to install this patch. Be sure to back up any custom files. Commonly customized files include raidabilities, bookmarks and market favs. ~ None at this time. ~ eq2ui_mainhud.xml - Added include for new combobox file. 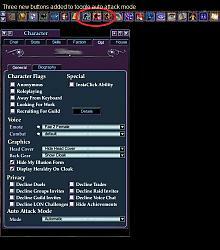 ~ eq2ui_mainhud_browser.xml - Updated to reflect yesterday's patch. ~ eq2ui_mainhud_help.xml - Updated to reflect yesterday's patch. ~ eq2ui_proxyactor.xml - Quest image includes added in. ~ Per a request, I've included the EQ2.ini file for new installs. Persona and Target windows were fixed for this update with 1.3 download, no changes were needed. Any idea when you will be putting out the update for the NPC Casting bar? Still fixing and finalizing a few things before uploading a patch. I have the buttons for browser links tested and working. The NPC casting bar I'm making a few changes to before uploading as well. Unfortunately I've not been able to find a reliable way to get the detriments to cure from both the new robust potions and spells (depending on class) so I'll be uploading a separate xml for the Fetish clickcures that will only cast the Robust cures, the other will use the cureplayer command. Hopefully SOE will get this fixed soon. 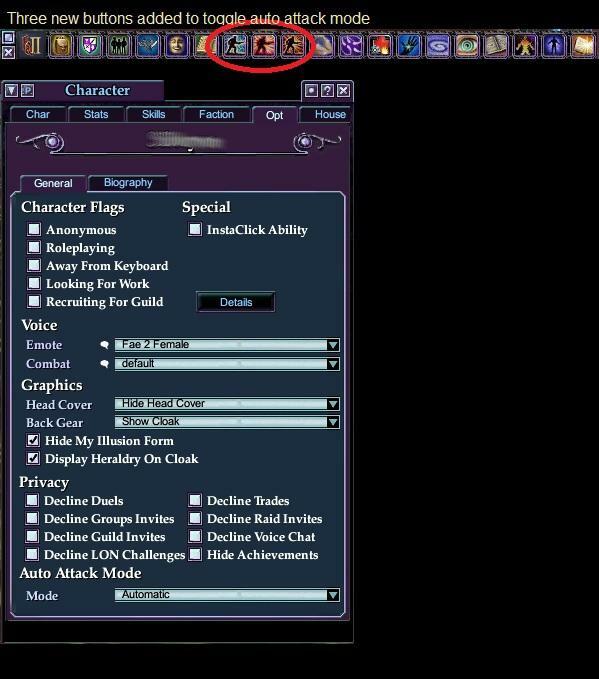 Just wondering if you have had a chace to work on the stand alone npc casting bar. My Guild Learder is Stressing because not everyone has one yet. I REALLY don't want to have to change UI's in order to get one. Last edited by shadow1567 : 07-06-2012 at 07:46 PM. Just wanted to let yall know where we are with the requested updates and default changes that will affect the ui. Self cures - I've tried a few things in hopes of not having to fully revert to the coding from back in 2010. I may have found a happy medium that will work temporarily until SOE can fix their end. Stand alone NPC casting bar - I've got a new version to test, will hopefully have the bugs worked out soon. Journal_active.xml - This fix is applied and ready to upload. Browser window - Fix is applied, will be testing sometime tomorrow. Thanks very much. That seems to have worked. Thanks again for the help and the awesome UI. Ok try this: Go to your FetishUI folder, and look for eq2ui_mainhud_clock.xml, right click and choose edit. Do a search (alt+F) for (MainHUD.StartButton) Change both instances of this to (Custom.Personabar). Do not add or remove any spaces or parenthesis. Let me know if this works for you please, if so I'll include it in the next update. I've not had a chance to look at this yet. Hopefully I can get something going by early next week. Ok tried the edit, put in the line like you said and still not staying visible upon log out and back in. Thanks for the help so far. I know there is a bar like I am talking about that works with Profit and a couple other custom UI's. Thanks for checking into it. I'll look into this and see about getting a fix out soon. ...Does not seem to be working... Also, there was a change in the color of the way point ring on the map. I was wondering if that was through Fetish or through eq2Maps. Make sure there is only one space before and after that bit of code. Save and exit. Let me know if you still have problems please. As for the maps - I didn't change anything dealing with the dots, arrows, points etc, other than to add in new items SOE added. Any changes are eq2maps or soe. I've not used the brower since the patch, however I did test the changes that were made and didn't have any problems. I believe this is a wide spread problem on SOE's end. You said you did a clean install, so my best suggestion would be to check out the eq2players forums and see what's going on over there. I'm not sure if this is possible, but I can definitely take a look and see if it will work. Last edited by Savie : 06-26-2012 at 03:41 PM. First off thanks Savie for continuing to keep this UI updated. I could not play without it. I know that there is a casting bar under each mob/npc's name to show what they are casting. But I play a healer and I am not always targeting someone that has the mob/npc targeted. So I was wondering if there was a way to get a bar that can be moved and sized that I shows what the mob/npc is casting without having to try and watch the little bar under the name of whatever is doing the casting. Let me know if this doesn't work for you and we'll try something else. Aye, I knew about that and have tried it several different times. Does not seem to be working. Thanks for the help and the quick response. Also, there was a change in the color of the way point ring on the map. I was wondering if that was through Fetish or through eq2Maps. Last edited by gosshawk982 : 06-23-2012 at 04:57 PM. Is there anyway i can get the selfcures to work? When i use the lvl 90 pots it works to cure yourself but the are to weak to get the detramental of me, and when i use the new lvl 92 once i can get them to work.